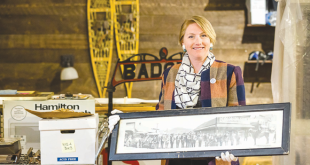 When public works director Marlene Crosby started working for Gunnison County in 1985, she worked at a desk in the corner of the shop building. There was little heat, the walls were unpainted and the lights barely cast a shadow. The crew was prone to throwing things at each other, and no one could tell Marlene exactly what the administrative assistant for the road and bridge department was supposed to do. “The only thing my predecessor said to the crew was, ‘You have to watch your language and you have to clean the bathroom because now we have a woman.’ So I wasn’t extremely popular,” she says. The interview panel included County Manager Mike Rock and Commissioner Fred Field. Marlene remembers a lot of discussion about whether she knew how to shoot grade (take elevations to prep for road grading). She didn’t even know what “grade” was. But she could type on the old Royal typewriter, and she had minored in business administration. “You have strong skills and I know your skills, I’m just not sure road and bridge is ready for a woman,” Field told her. Still, Marlene landed the job and it fell to her to figure out what that meant. Administrative responsibilities had been spread out over various departments, and there was no filing system to speak of—only boxes of paperwork and miscellaneous stuff. “On my run to the courthouse I would buy, oh, maybe some pencils today—College Stationery was on Main Street—and the next day I’d buy some paper just so I had someplace to go, something to do to fill my time,” Marlene says. Her primary job, she says, was to earn the trust of the men in the shop and on the road crews. She celebrated their birthdays (and still does, baking each of them a cake) and went to bat for them on unresolved work issues like accrual of comp time. Gradually, Marlene earned the trust of the crew and county administrators. Within a year, she had taken over management of the shop. When the road and bridge supervisor resigned in 1986, she took over his responsibilities as well, receiving the title of road and bridge coordinator on a trial basis. Marlene performed well enough to earn the title of supervisor, and over the years she gradually took over management of all the departments that eventually became Public Works: Solid Waste (including landfill and recycling), the Weed District, and Utilities (including water treatment and waste water collection systems). Marlene excelled in a world typically dominated by men—when she went to her first Colorado Counties conference, she was the only woman to show up at the Colorado Association of Road Supervisors and Engineers meeting, which is part of that conference. Today, she is the association’s longest-term member (she prefers not to use the word “oldest”), and her success has earned her a reputation. Just this year the Gunnison Business Women named Marlene the 2012 Woman of the Year in recognition of rising through the ranks in a man’s world. But Marlene hasn’t thought about it that way for years. She sees public works as a vital part of a thriving community. “I think of us as all having a common goal and having things we need to get done. I always tell the commissioners your biggest asset isn’t the yellow iron parked out there… It’s the people who work in this department because they care about what they do, they take pride in what they do, and they want to be the best they can be. That’s the success,” she said. Marlene values working with her crew so much she’s stayed in public works instead of pursuing other positions in the county. She attributes her longevity to that and the chance to learn new things—always. Just as she got her arms around road and bridge, she took over solid waste. That came with a whole new set of regulations, new staff and new challenges to figure out. It’s the same drive that’s led her to become a fixture in the community as a long-time member of the Vashti Rebekah Lodge and now the Waunita Chapter of the Order of the Eastern Star. 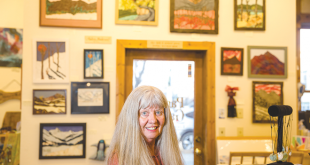 She volunteers for the Gunnison River Festival and the U.S.A. Pro Cycling Challenge, staffs the Trails Commission, and perhaps closest to her heart, spends time at the Willows Assisted Living, where she and her husband, Don, coordinate crafts and activities, and help the residents decorate for the holidays and sing with them. 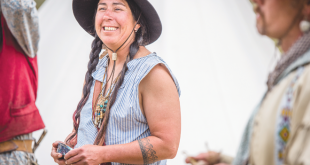 Throughout it all, she has drawn heavily on her training as a teacher, a degree she earned through Western State College. She taught third grade for two years in Leadville and returned to Gunnison to care for her mother. There were no teaching jobs in Gunnison, so she worked at Chapman Equipment, managing the parts department and handling customer service and warranty claims until she went to work for the county. “I would not have traded that education for another major because of the things you learn if you’re going to be an elementary teacher,” she said. Still, the transition wasn’t without its bumps. Marlene ruffled a few feathers when she required training in first aid and equipment maintenance. She also asked the crew to track their hours so she could track the resources that went into maintaining county roads. The move caused some workers to resign, but with time she saw results. “You start with a core group of people and then slowly move forward working with them and the expectations you gave them when you hired them, so part of the long term is putting in place a workforce,” she says. She now works with a crew that includes long-time veterans of the county and foremen in their 30s. It’s a great balance of old and new, and now that they’ve moved into the new public works building on Gold Basin Road she sees her crew putting their expertise to work in new ways. They can now repair engines on site, something they’ve always had the skills to do but never the space, and on winter mornings they can start up the plows and begin plowing their routes without cleaning off the snow and waiting for the equipment to warm up enough to operate. They were supportive, even back then—some things just take time. And as it turns out, that was okay. Marlene wasn’t going anywhere.